Audio Cable Assemblies at HAVE Inc. Audio Cable Assemblies at HAVE, Inc.
We feature the best analog and digital audio cable assemblies available anywhere. 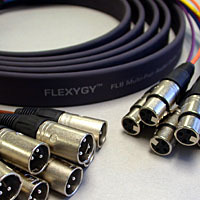 The menu choices below will take you to speaker cables, audio interconnects, audio patch cables, microphone and line level balanced audio cables, instrument cables, and both analog and digital audio snake cable assemblies. Just to name a few! You will also find a large selection of both length and colors for many audio assembly types. If the cable assembly you are looking for is used in audio distribution or transport, we have it. If you don't see it here, give us a call. Odds are we have it or we can fabricate it in just a day or two, here in our own guild cable shop.